Two groups of people with normal weight. A six week long study. The LC reduces the carb intake from 48% of Calories at the baseline, to 8% during the study, and the fat intake increases from 32% to 61%. 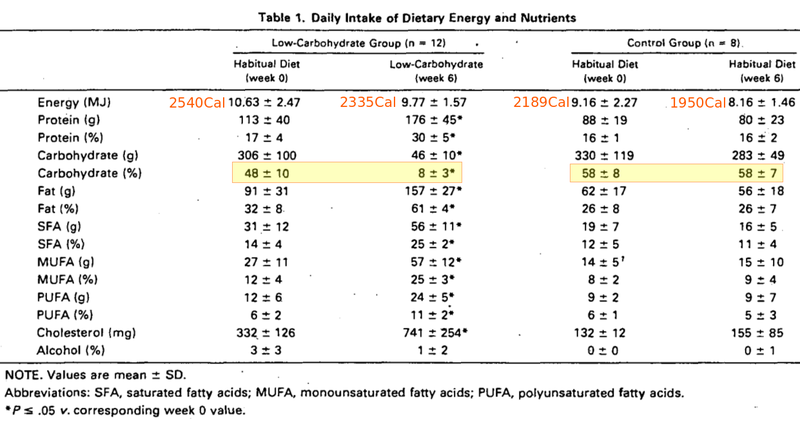 The HC groups keeps its normal diet during the study, with a 58% of Calories from carbs and 26% of Calories from fat. The LC decreases a little its total Calories intake compared to the baseline values, but they keep it above 2300 Calories/day. The HC group reduces their intake approximately by the same amount as the LC group, and they are below 2000 Calories/day during the study. At the end of the sudy, the LC group has lost one sixth of their body fat (from 20.5% to 16.9%) and they gained muscular tissue. The HC group doesn’t lose body fat (from 22.1% to 22.0%) and they also gain muscular tissue (one thirds of what the LC group gained). The LC group lost 2.2Kg, while the HC group gained 400g. 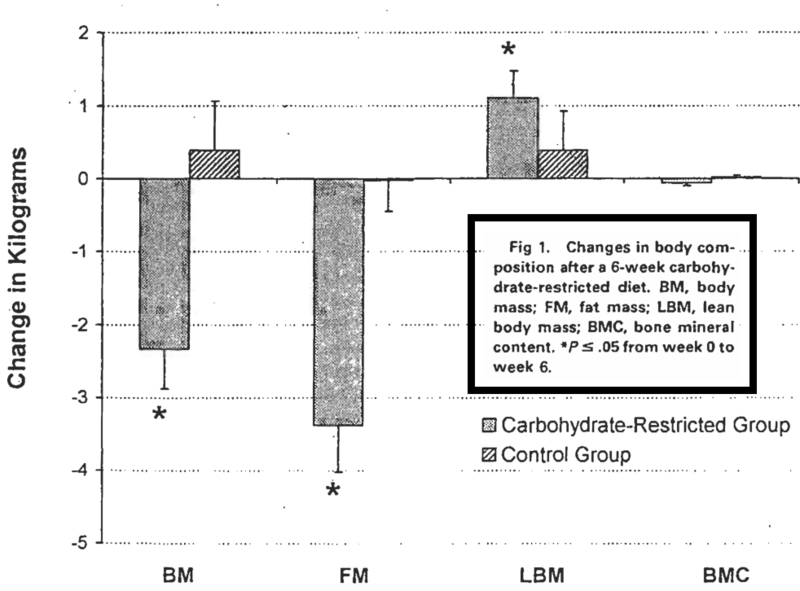 In the graph below the “FM” bar shows the body fat change (Kg) for the LC (carbohydrate-restricted) group and for the HC (control) group, although we don’t see a bar for the HC group because there was no change in the body fat for this group. Both groups decrease their Calorie intake by the same amount of Calories, but the results in terms of body weight and specially body fat change were completely different.